Inglés Málaga Pasapalabra Twister is a word game which will liberate your mind, improve your vocabulary, and ensure you laugh your pants off. Can you describe a crazy octopus playing the drums? Do you have the linguistic dexterity to express a happy pirate frying fish? Can you help your team win the Inglés Málaga Pasapalabra Twister trophy? 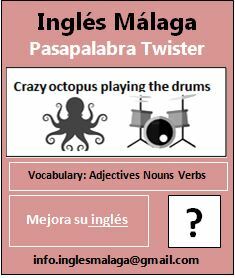 If you think you’ve got what it takes to be an Inglés Málaga Pasapalabra Twister contestant, and improve your English communication skills at the same time, why not take part in an Inglés Málaga Pasapalabra Twister event? Required English Level: Every event will be adapted to suit different levels. Minimum B1. Number of participants: Between 4 and 6. Cost: Early Bird Promotional Discount: 10€ per person. Additional 25% discount if you bring a friend and you are, or have been an Inglés Málaga client / student. Valid for your first Inglés Málaga Social Meet-up Event.